There is some evidence of a projected film called Polish Gothic around 1936: this title and date are attached to several sequences of black and white images of medieval carvings in stone and polychromed wood which don't relate to any other film. In 1944, in the same work schedule as The Eye and the Ear, the Themersons had plans for another wartime film called, provisionally, The Child of Europe. It was to be about a child growing up during the war when norms of behaviour and patterns of expectations are derailed, and to contrast these with conventional patterns of life in peacetime. Whereas an adult's wartime world is inhuman and devastating, for a child it may be correct and normal since this is the only one it knows. The screenplay was to be developed with Hannah Segal, the commentary by Julian Huxley and Anna Freud. Another proposal, probably from the late 1950s, is for Chopin's Piano. A six-page draft script suggests a repertoire of visual equivalents to the language of sound and music, first with natural sound, then with the piano, and finally with the orchestra, using music from Chopin and Szymanowski. There is also a brief typescript for a comic film called Claiming the Moon, in which a text of an article from The Times of 7 March 1959, is to be treated as a screenplay, intermittently 'visualised and pictured' by Franciszka Themerson. In the article, a Washington congressional committee is worried about the Russians planting a flag on the moon, and the claiming of rights. Ensuing questions about the curvature of the earth and territorial rights in space need no editing to make a good slapstick script. 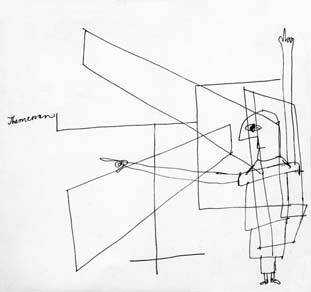 There is a sketchy pencilled storyboard by Franciszka, and a group of related pen drawings. It was altogether characteristic of the Themersons to pick up ready-made material and assimilate it. From the outset they liked using worthless materials, and simple hands-on processes. When Moholy-Nagy called Europa a sophisticated film, Stefan thought he'd got it quite wrong. He thought of it rather as 'primitive', by which he meant it dealt directly with the innate properties of the medium without pretension, technical or otherwise. His feeling for film-making was to do with the sovereign properties of the medium itself. He thought cinema lost something the more it approached anything else, the theatre, for instance. He liked silent movies best. Vigo's l'Atalante was a yardstick for him.